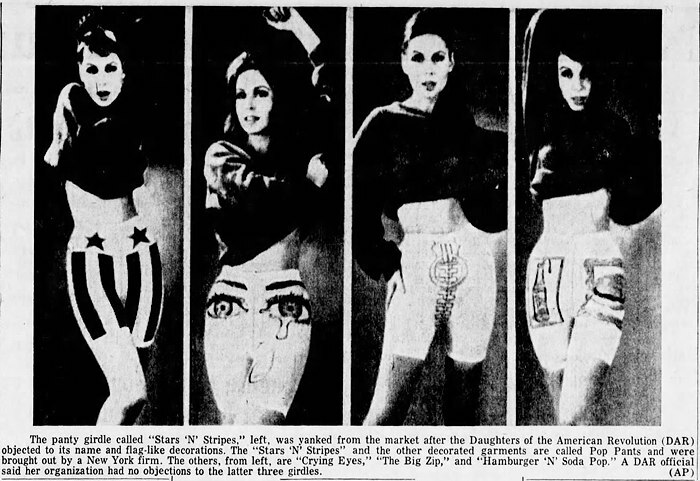 Introduced in 1965 by the Treo Company, and promptly withdrawn from the market on account of complaints by the Daughters of the American Revolution. 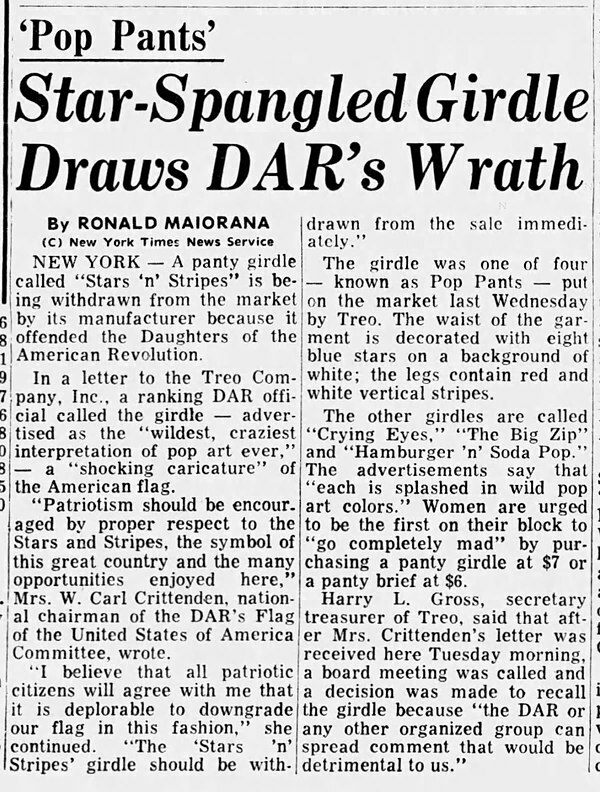 In a letter to the Treo Company, Inc., a ranking DAR official called the girdle... a "shocking caricature" of the American flag. "Patriotism should be encouraged by proper respect to the Stars and Stripes, the symbol of this great country and the many opportunities enjoyed here," Mrs. W. Carl Crittenden, national chairman of the DAR's Flag of the United States of America Committee, wrote. "I believe that all patriotic citizens will agree with me that it is deplorable to downgrade our flag in this fashion." 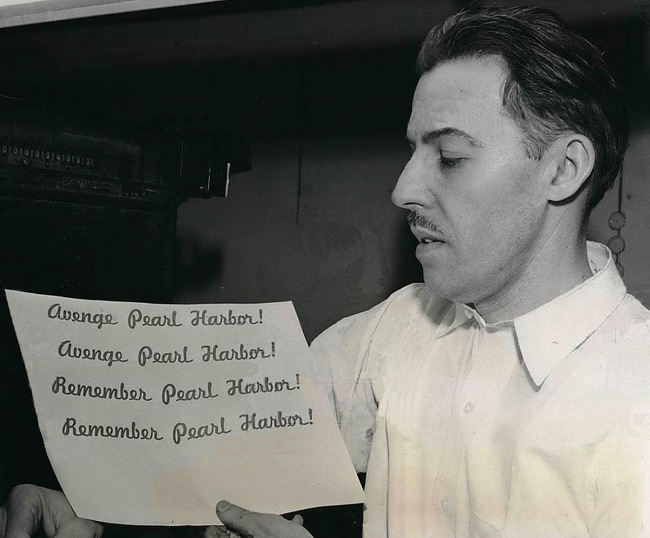 December 1941: Following the Japanese attack on Pearl Harbor, Chicago printer Louis Fortman claimed exclusive right in Illinois to the use of the slogans "Remember Pearl Harbor" and "Avenge Pearl Harbor," insisting that he had originated and printed the slogans on December 8 and had registered them under the state's patent and trademark laws. Anyone wishing to use the slogans would need his permission — and would need to pay him. However, Fortman said he was willing to let them be used, at no charge, for "patriotic purposes and to aid defense activities." 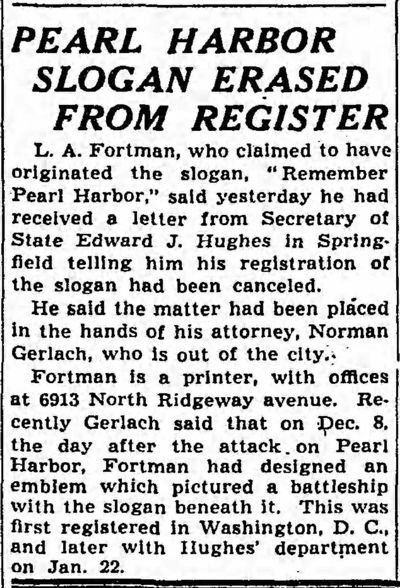 In response to public outrage, Illinois Secretary of State Edward J. Hughes canceled Fortman's registration of the slogans. To all of you who served or are serving in the military, thank you for your service. Your sacrifices should never be forgotten. 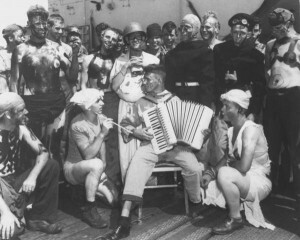 Perhaps you've heard of the naval ceremonies involved when a ship crosses the Equator. Well, here's how our virile warriors used to celebrate the occasion. Not sure what happens in today's co-ed Navy. On her resume, cabaret comedienne Amy Gordon lists her Special Skills as: Rollerskate dancing (disco, tap), Ukulele, Swing Dance, Tango, Stilts, Slackwire, Rolling Globe, Yoga, Prat/Stairfalls, Hat-tricks, Juggling (pass clubs, knives, fire), rubber face/body, dialects, Dutch/French languages, Pyrotechnic Shooter. Her acts include doing a Flamenco dance on rollerskates, singing "Taint No Sin" accompanied in harmony by skulls she wears as a bra, as well as playing "America the Beautiful" in three part harmony on kazoos from three different orifices. The latter act you can see below. Click on the image twice, to get them really big! A reader named John, commenting on the WHY STUDY SCIENCE? thread, asked to see a film about surviving atomic attack. 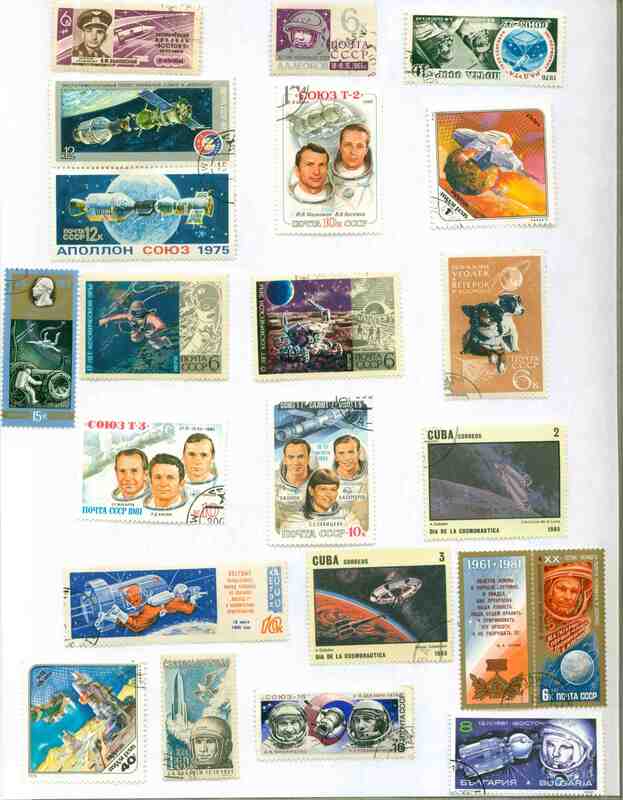 Here it is, John! 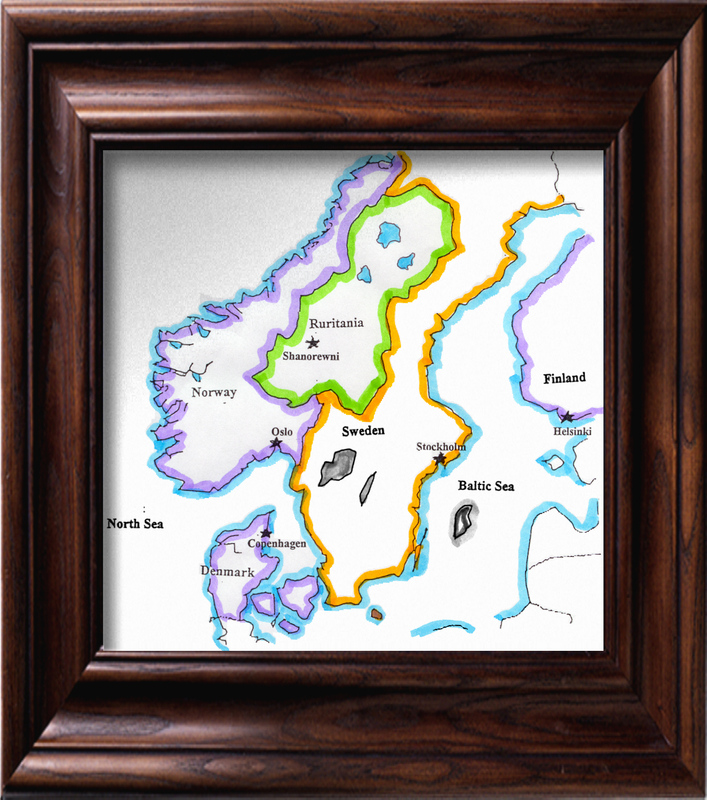 The concept of micronations is a fascinating idea. I utilized the notion in one of my recent stories, the title piece from The Emperor of Gondwanaland and Other Stories. But I hardly began to exhaust the narrative possibilities of the idea. Here's a recent article on one such place, the Republic of Molossia.